If the number of bullets that were shot off in Free Fire were to hit as often as the jokes, I imagine it would have resulted in a much shorter film. I had no expectations walking into Free fire and was quickly rewarded with a satirical nudge at gun violence and a very stylized homage to shoot ‘em up flicks. 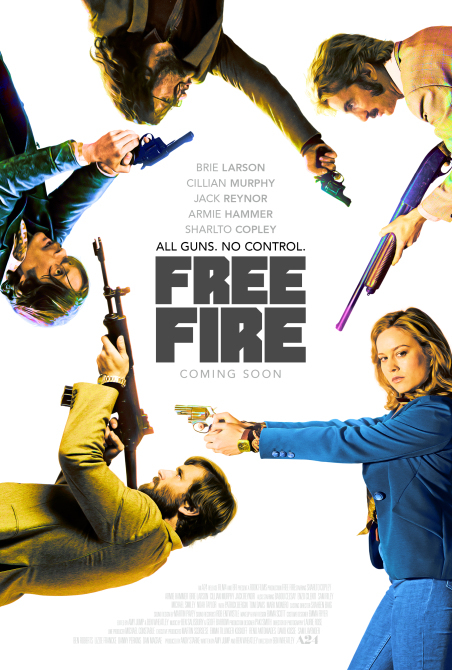 Free Fire is placed some time in the 70’s where a weapons delivery goes awry between an arms dealer, Vernon (the amazing Sharlto Copley from District 9), his crew and Irish mobster types, Chris (Cillian Murphy 28 Days Later, Sunshine) & Frank (Michael Smiley from Kill List/Rogue One). With the exception of Justine (Brie Larson) who appears as a liaison between the two groups, it’s an all male cast with bullets and testosterone flying around an abandoned warehouse for 1hr 30 minute gunfight and I didn’t look at my watch once. Sharlto Copley is great to watch as the goofy arms dealer with his whiny high pitched S. African accent. He’s perfectly without charm, yet he steals the show hands down. Also an honorable mention goes out to his right hand man, Ord (Armie Hammer). His almost contemptuous attitude towards, well everyone, is perfectly executed every time he opens his mouth. I would have to say that it was difficult to tell if Brie Larson is impersonating a wooden plank with her drier than dirt performance, or if director Ben Wheatley instructed her to underplay every reaction. The whizzing bullets and action felt like a convenient vehicle for the snappy dialogue and one liners, lest the audience grows bored without some visual fodder. I was happy just to watch the over the top interactions between the half wits and hooligans that made Free Fire oh so fun.